This excerpt is from a blog, School Counselors Matter, by Lauren Hubbard, Jordan Tafari and Sophie Zamarripa. Read the full post here. 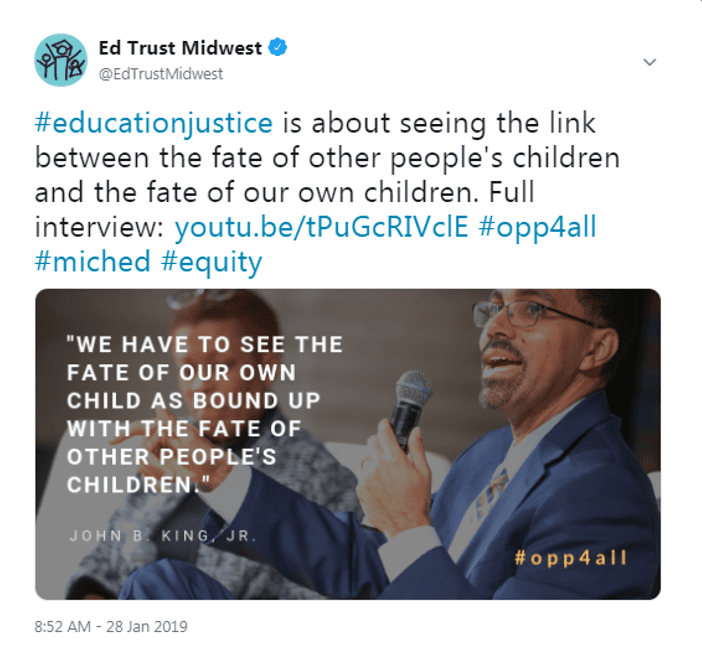 Supporting the academic and social-emotional success and well-being of students is a critical role for the team of educators that interact with Michigan students each day. In addition to classroom educators, school counselors are essential for supporting student success. 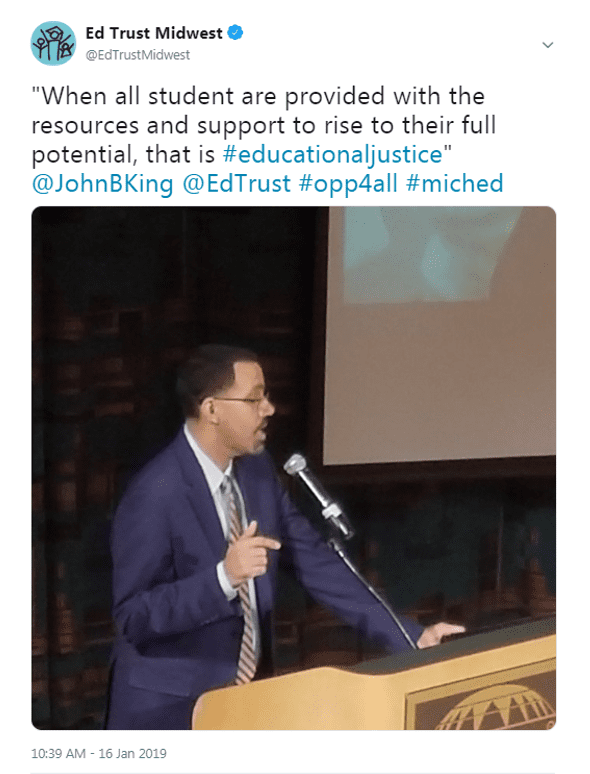 Yet across Michigan and throughout the nation, students are denied these important resources and supports, particularly students with the greatest need. This week is School Counseling Week in Michigan – highlighting the role that school counselors play in the lives of students in school, for post-secondary education planning and in life. [R]esearch links increased access to school counselors in high-poverty schools with higher student attendance and graduation rates as well as lower disciplinary rates. 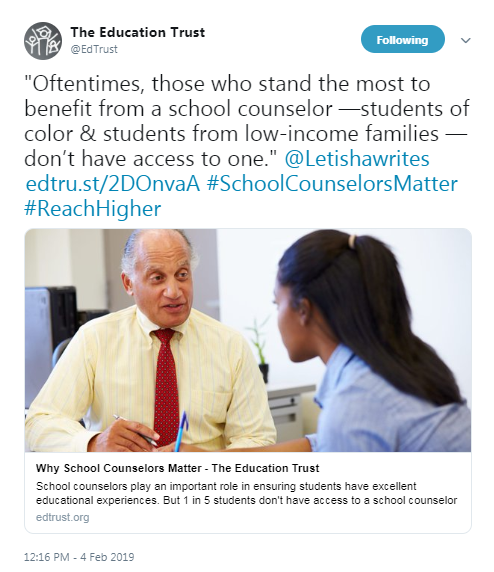 Research also demonstrates that Black students and prospective first-generation college students are more likely to identify their school counselor as the person who had the most impact on their thinking about postsecondary education than their White or non-first generation peers respectively. According to a recently-released fact sheet from The Education Trust, Reach Higher, and the American School Counselor Association (ASCA) last week, Michigan is both failing to meet the student-to-school-counselor ratio recommended by research as well as lagging behind national averages. 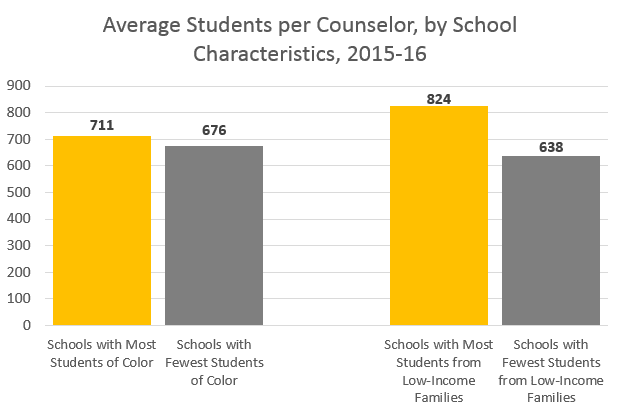 Nationally, across all K-12 schools, the average student-to-school counselor ratio is 464 to 1, which is nearly double the ASCA’s recommended ratio of 250 to 1. In Michigan, this ratio is 700 to 1. For Michigan to become a top ten education state, all Michigan students must be supported to succeed in school and in life. School counselors play a critical role for helping students navigate complex education systems, post-secondary options and a wide range of challenges in and outside of the school building. Over the past few weeks, education committees in the Michigan House of Representatives and State Senate have been named. Members of the Senate Education and Career Readiness Committee are listed below. Over the next several weeks, check back for other committees impacting education policy and budgets. Senate Education and Career Readiness Committee will meet today, Feburary 5 at Noon in room 1300 of the Binsfeld Building. Agenda: organizational meeting. Michigan State Board of Education will meet on Tuesday, February 12 on the Fourth Floor of the John A. Hannah Building. The agenda will be posted here. State of the State Address: Governor Gretchen Whitmer is scheduled to give her first State of the State address on Tuesday, February 12 at 7:00 pm.